I brought home a new EVOO (Extra Virgin Olive Oil) tonight. We are finishing up with the Southern Hemisphere, spring pressed olive oils and anxiously awaiting the fall press from our Northern Hemisphere suppliers in California, Italy, Greece and Spain. What I brought home was the tail-end (less than a salable amount) of Fratoio/Leccino from Chile. It was crushed in May and has a really delicate combination of green apple peel and fresh-cut, green hay. I can envision scallops seared in it. My counter is becoming littered with bottles containing tasty dribs and drabs of oils and vinegars. Some really fine Chilian Extra Virgin Olive Oil. Suddenly, recipes are showing up in my inbox. Trusted friends are writing and some even include photos of their creations. I am crafting a loose collection of fun “foodie” stuff, for the store website and beyond. The store is also providing me with a whole world of new characters to populate the next chapter of my life. I love feeling a part of a community again – recognizing customers and folks from neighboring businesses in town. It’s a such a compliment when they recognize me and comment. Ah, but Mata Hari, you have slipped! I rack my brain, every time you show up with a comment, as to who you are. You have evaded my attempts to bait you and discover your identity in the past. I have a new clue. 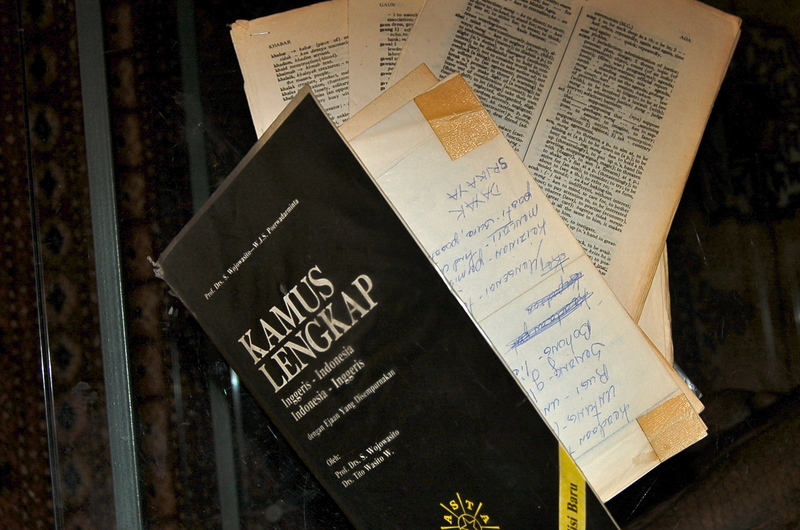 Either your spelling stinks or my ancient dictionary is wrong. For the spelling of them is “mereka”, you missed an “e” or am I wrong? To my other readers, I apologize for going off on a tangent with this commenter. It just fascinates me that from the beginning, over a year ago, every few months this person shows up and always communicates with me in a long-forgotten tongue. It’s so private and unsettling when one is communicating their thoughts and emotions to the world, only to have it replied to from so long ago. This entry was posted in Lifestyle. 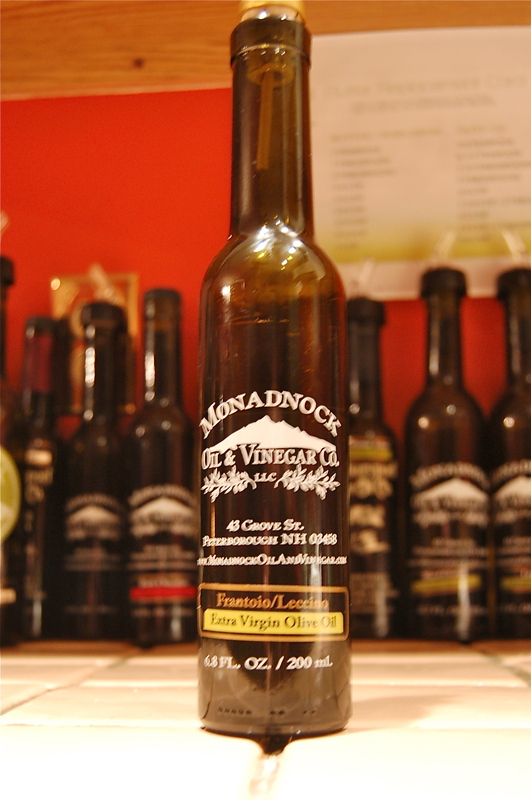 Tagged balsamic vinegar, balsamic vinegar recipes, New Hampshire, olive oil. Just in case folks think we’re out of the way, here in the Granite State. Chilean olive oil? With a Monadnock label? My elder daughter sees this and she’ll want to grow olives here. Figs are tricky enough. Add to that the mysterious voice from the other side of the globe and a life from 30+ years ago and yes, the Granite State is more than a state of mind! Thanks for dropping by Jnana! You’re far more patient than me, although I once tried to learn a few words in Russian so I could speak to the fiancee of a friend. I’m still not sure exactly what I said but she smiled so it couldn’t have been too bad. I can see it now, Martha’s EVOO cookbook. I can’t wait to get back and come over so you can cook dinner! Glad to hear that you are so happy in your new position, it really is nice to get to know your customers and have them know you. As to your mystery friend, it would be interesting to find out who it is, perhaps it is one of the house servants you had or one of the people you sold images to or with. Your support is kind, Laura. I’m not sure about the cookbook but certainly I have some recipes that beg for your help as a tester. I think I like having the mysterious commenter remain a mystery. It’s fun to speculate.